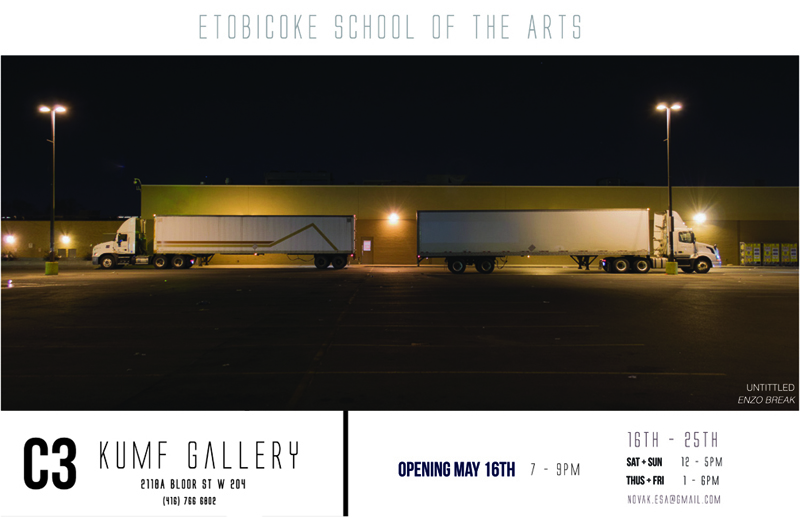 Etobicoke School of the Arts (ESA) photography students are looking forward to showcasing their senior class’ art for the third consecutive year in the Scotiabank Contact Photography Festival at the KUMF Gallery. This body of thirty Grade 12 student’s work includes digital and film based photography. A vast range of large scale and intimate work encompass a variety of formal and conceptual approaches. The photography program at ESA is designed to encourage student artists to explore issues that are important to them while experimenting with this historically rich, yet rapidly changing expressive medium. This collection of contemporary art embodies student voice and provides viewers with a glimpse of what is possible when a young artist explores the human condition. Each student’s process is personal, thoughtful, and often full of risks. These artists build upon honest interests with targeted contemporary research that revolves around one clear direction in the area they wish to explore. The final embodiment of each student’s creative inquiry is captured here through a series of exceptionally powerful and engaging images.